From basic skills to riding technical trails like a pro, having a bit of guidance goes a long way. 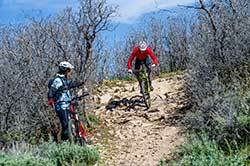 We offer beginner to expert-level mountain bike lessons with rentals included to help you advance your skills and sharpen your technique on the trails. In addition, we offer no-drop weekly group rides all summer long for you to get out with others at the same skill level for a fun, no-worries ride! For more information, call our Experts at White Pine Touring at 435-649-8710 or email us at experts@whitepinetouring.com. If you’re in need of a rental, we offer a quiver of full-suspension mountain bikes. From mid-level recreational bikes to top-of-the-line cross country and trail bikes, Jans has a bike ideally matched to your skill level. 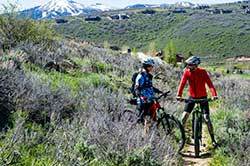 We offer unisex, women’s-specific, and kids’ bikes so the whole family can get out on Park City’s vast trail network. Please note that a rental mountain bike is included in the price of a Mountain 101, 201 or 301 lesson. 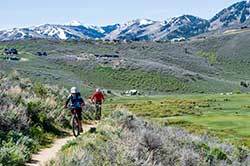 First timers who take a mountain bike (MTB) 101 lesson are guaranteed to learn how to get on and off a bike, pedal, shift gears, and brake – all the basics. If you take an MTB 101 lesson and feel that you did not adequately learn these skills, then we’ll give you another lesson for free. Scheduling for free MTB 101 lesson subject to instructor and rental bike availability.